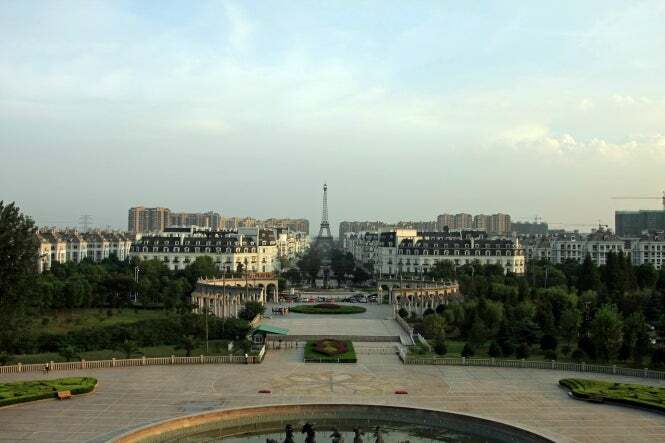 A CHINESE replica of Paris complete with avenues of Haussmann-style apartments, a mini-Montmartre and crowned with a replica of the Arc de Triomphe and a 108-metre high Eiffel Tower is a total flop. Townspeople have returned to farm allotments in the ornamental gardens under the tower, as the crowds predicted to swamp the development never materialised. The Tianducheng development is the in the suburbs of Hangzhou in the Zhejiang Province of China and was supposed to become home to 10,000 of China’s newly well-heeled middle class when construction began in 2007. But, owing to its location, far from anywhere and surrounded by farmland, almost no one lives there. The spirit of France’s capital was not strong enough to capitalise on China’s Francophile fashions. The only residents of the 12-square miles of faux-Parisian streets are a couple of hundred retired locals, mostly employed to maintain the development. Other owners bought property in the development but only for speculation and with no intention of ever living there. While the novelty has attracted some visitors, their numbers are nothing like those needed to sustain the community. As its gardens have become overgrown, townspeople have begun to cultivate them as farmland. This is not the only homage to France in China. Millionaire Zhang Yuchen spent $50million building a replica of the Parisian landmark Château de Maisons-Laffitte on the outskirts of Beijing. The lavish interior is a faithful copy of the original. The property is used as a hotel and conference centre but also houses a wine museum and a luxury spa. It is known locally as the Zhang Laffitte and is surrounded by a moat, French-styled gardens and vineyards. Staff all wear traditional French uniforms.